On Friday the White House recognized International Holocaust Remembrance Day. 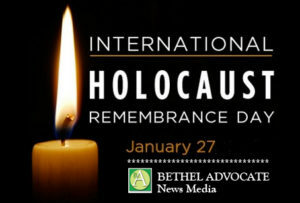 “On International Holocaust Remembrance Day, we acknowledge this dark stain on human history and vow to never let it happen again,” the White House statement read. In 2017 Trump was criticized for not mentioning Jews in the statement. The Museum of Jewish Heritage, located at Edmond J. Safra Plaza, 36 Battery Place, New York, NY 10280 (Phone: 646.437.4202), commemorates International Holocaust Remembrance Day with free admission on Sunday, January 28. See their new family-friendly installation, The Number on Great-Grandpa’s Arm, (on view January 21, 2018 – April 29, 2018) have a conversation with two Holocaust survivors in the acclaimed New Dimensions in Testimony℠, and light a candle of remembrance in their communal space.